I.1 Faradays Law. I.2 The Principle of Charge Conservation and Distribution of Charges in a Conducting and Polarizable Medium. I.3 Displacement Currents. I.4 The System of Equations of the Electromagnetic Field. I.5 Equations for the Fields E and B; Electromagnetic Potentials. I.6 Propagation of the Electromagnetic Field in a Nonconducting Medium. I.7 Quasistationary Field in a Nonconducting Medium. I.8 Quasistationary Field in a Conducting Medium; Skin Effect. I.9 Diffusion of a Quasistationary Field. I.10 Diffusion and Periodic Quasistationary Fields. I.11 Distribution of the Electromagnetic Energy; Poynting Vector. I.12 Determination of Electromagnetic Fields. I.13 Relationships between Different Responses of the Electromagnetic Field. II.1 Frequency Responses of the Field Caused by the Magnetic Dipole. II.2 The Transient Responses of the Field Caused by a Magnetic Dipole. 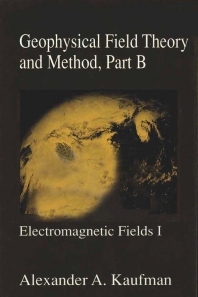 This book contains information about the theory of electromagnetic fields in conducting mediums. It describes the theoretical foundation of electromagnetic methods used in all areas of exploration geophysics, including a study of the earth's deep layers. This book will be useful for research and exploration geophysicists, electronic engineers, and graduate and undergraduate students in university geophysics departments. All geoscientists and geoscience students involved in earth measurements. Emeritus Professor A.Kaufman has 28 years’ experience of teaching at the geophysical department in Colorado School of Mines He received his PhD. in Institute of Physics of the Earth (Moscow) and degree of Doctor of Science from the Russian Academy of Science . From 1981 to 20015 he published 14 monographs by Academic Press and Elsevier, describing different geophysical methods. Most of them are translated and published in Russia and China. He also holds three patents, which found application in the surface and borehole geophysics. A. Kaufman is a honorary member of SEG.